Sturdy super bright tagboard adds color and excitement to any poster sign or art project. Five colors available in each assortment in two convenient sizes. 100 sheets per film wrapped package. Assorted colors include: Bright Pink, Bright Orange, Bright Lime, Bright Yellow and Bright Blue. Acid free. Recyclable.100 sheets. 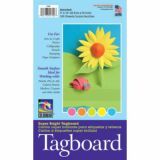 Sturdy, super bright tagboard adds color and excitement to any poster, sign or art project. 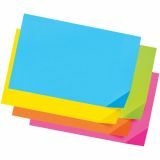 Five assorted colors include Bright Pink, Bright Lime, Bright Orange, Bright Blue and Bright Yellow. Recyclable. 100 sheets. 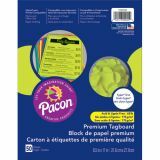 Exceptionally strong, multi-purpose tagboard can be used for hundreds of arts and crafts projects. 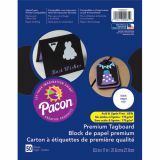 Same color on both sides, and has a smooth surface for working with pencils, pens, markers, crayons, and other media. Acid free.100 sheets. 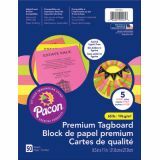 Exceptionally strong, multi-purpose tagboard can be used for hundreds of arts and crafts projects. Same color on both sides, and has a smooth surface for working with pencils, pens, markers, crayons, and other media. Acid free. 100 sheets. Strong 65 lb. 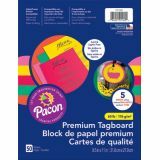 paper great for art projects, crafts, card and recipe making and more. Inkjet and laser printer compatible. Acid free. 8-1⁄2" x 11". 50 sheets. Colors included: Emerald Green, Rojo Red, Lemon Yellow, Pumpkin, & Hot Pink. Strong 65 lb. 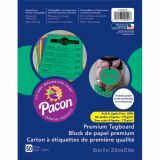 paper great for art projects, crafts, card and recipe making and more. Inkjet and laser printer compatible. Acid free. 8-1⁄2" x 11". 50 sheets. Colors included: Hyper Yellow, Hyper Pink, Hyper Orange, Coral Red, & Hyper Lime. Strong 65 lb. 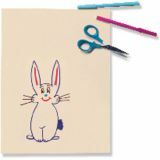 paper great for art projects, crafts, card and recipe making and more. Inkjet and laser printer compatible. Acid free. 8-1⁄2" x 11". 50 sheets. Strong 65 lb. paper great for art projects, crafts, card and recipe making and more. Inkjet and laser printer compatible. Acid free. 81⁄2" x 11". 50 sheets.